All the available grants have now been awarded and extensive repair and restoration work has been carried out to the priority projects and buildings in the High Street. It is vital now that owners and tenants continue to look after and care for their buildings.The attached Dalkeith repair and maintenance guide is available to assist with the regular maintenance advice and has a handy checklist for annual maintenance inspection. Lack of regular maintenance resulting in initial minor repair jobs such as down pipes and rhone clearing/unblocking not being done leading to more extensive water penetration into stonework causing external and internal damage and hence more expensive repair bills..." a stitch in time........" . Where maintenance /repair had been carried out it was often found to be done using inappropriate materials and techniques, ie hard cement renders and mortars used on soft sandstone, resulting in further damage and deterioration to the fabric of the building. The lessons are clear, timely, regular maintenance and repair using the correct materials and techniques saves money and effort in the long run and safe guards the future life of the building. Much of the orginal stone used in the centre of Dalkeith on buildings dating from the realy 19th Century onwards was a soft sandstone from local quarries now no longer in operation. In order to find a suitable stone for repairs and indenting new stone where necessary the British Geological Survey from Edingurgh has been appointed to carry out some sample stone analysis and have recommended suitable replacements from a quarries that are still in operation. Relaunch of the Home Owners Repair and Maintenance Guide . The Home owners repair and maintenance guide was relaunched at a homowners seminar on the 22and May 2013 in Dalkeith Arts Centre . 80 people attended the event and a new home owners repair and maintenance guide together with a DVD was available , click here to down load the new guide . 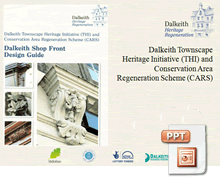 Dalkeith THI & CARS Project Manager, 11 South Street, Dalkeith, EH22 1AH.